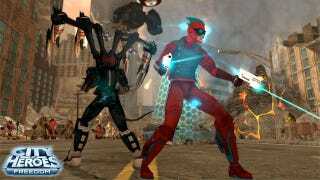 Superhero MMO City of Heroes is killing its monthly fee with the advent of City of Heroes Freedom as the game transitions from subscription-based model to a new, free to play one. Publisher NCsoft and developer Paragon Studios detail the plan to bring City of Heroes to a larger, pay-what-you-want audience today, explaining that the game known as City of Heroes will soon be known City of Heroes Freedom, that the game is forgoing the monthly fee barrier of entry but that subscribers still have a place in this superhero versus supervillain virtual world. Players can still choose to subscribe to City of Heroes Freedom, granting them VIP status, which in turn grants paying players a long list of rewards and services. Free players can still play, but they'll need to buy certain features and upgrades piecemeal. There's a handy comparison chart right here, if you're interested. City of Heroes Freedom launches for PC MMO players later this year, but NCsoft is encouraging subscribers to re-up (or stick with the game) to receive some goodwill awards. As a City of Heroes outsider, this seems like a smart business move for an aging MMO, a model that we'll see more publishers follow. What say you, City of Heroes vets? How do you feel about the change?